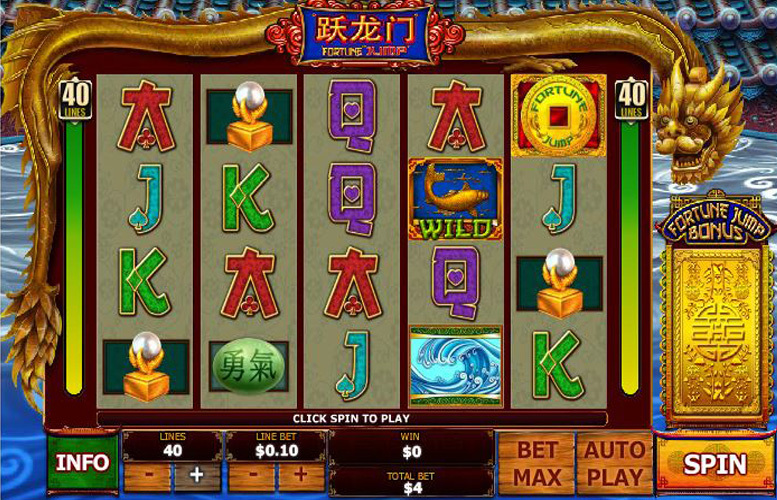 The Fortune Jump Slot from Playtech takes players on a trip to a peaceful Koi pond in ancient China. As you’d expect, most of the imagery is typically oriental, and overall the gameplay is relaxing but don’t let that fool you – there are plenty of opportunities to win big. This is in part thanks to the games somewhat unique bonus rounds. 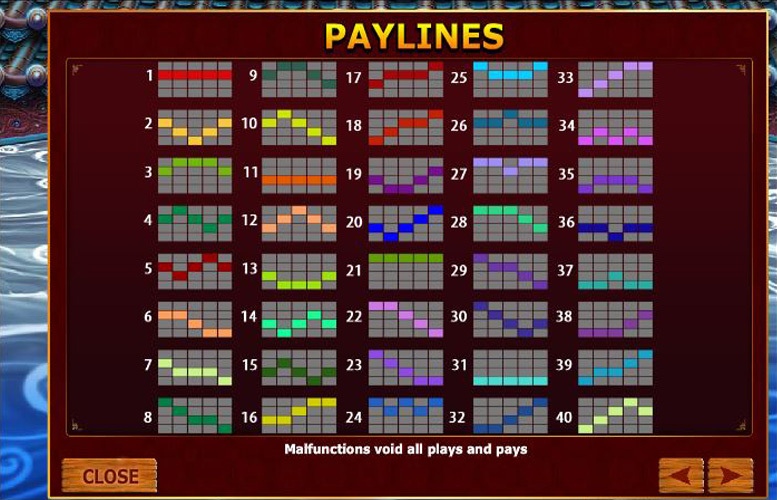 Fortune Jump features a huge 40 pay lines, across four rows, and five reels. This provides a huge number of ways to win, and overall the slot has one of the best return-to-player ratings in the industry. With players receiving on average 96.1% of their stake back per spin, there are plenty of opportunities to get lucky down by the fishing pond. Huge number of win lines makes for a close to breakeven slot when set to their maximum. Large number of different ways to mix up and vary your bet size. With settings to adjust your coin value, the number bet on each line, and the number of lines, there’s huge scope for experimentation when it comes to sizing your wagers. Unique take on bonus rounds. If you’re tired of playing the same format special features, Fortune Jump mixes things up nicely. Not exactly a looker. Fortune Jump isn’t the most visually appealing slot around. It’s kind of plain, and the dragon wrapping around the reels is less than impressive. Hitting large five-of-a-kind combinations doesn’t win you nearly as much as it does on other slots. Given the generous bonus structure, this is a minor criticism. 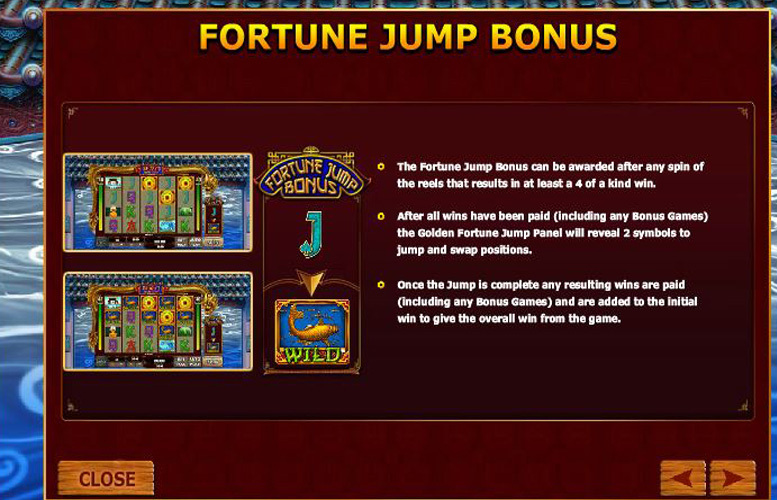 As mentioned, big five-of-a-kind with high symbols are not the way to get paid out big on Fortune Jump. Wilds, and the pond will bag you just 500 coins, the crashing wave earns 200, and the crystal ball, and Chinese characters will earn the player just 150. As the highest bet size is $5, this makes the top win from a five-of-a-kind just £2,500. Not great at all, when you consider the five figure sums other machines offer. Fortune Jump makes up for its small pay outs for matching symbols in plenty of other ways. The game features three bonus features that are markedly different from other slots. This feature can be awarded after a player matches at least four symbols across a win line. It involves the ominous gold box to the right of the main game reels. After activating the bonus, the box opens and reveals two symbols, one is the one you won on, and the other will be random. The winning symbol magically replaces all the instances of the other from the box, resulting in potential new wins. 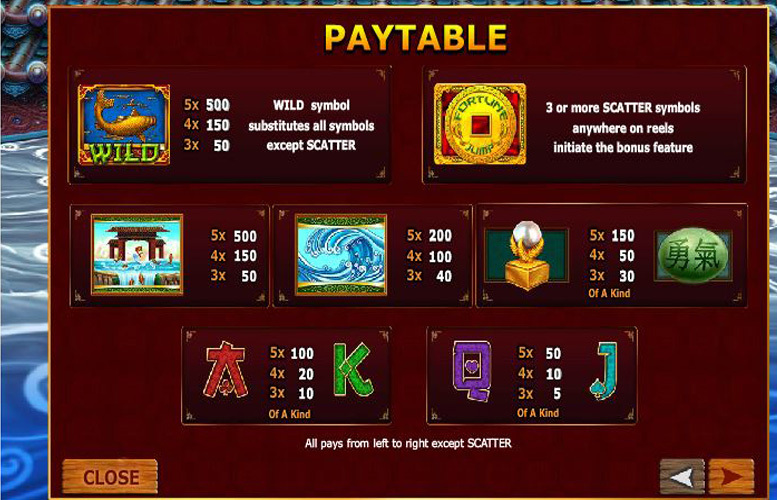 Land three or more “scatter” symbols (Chinese dollars) anywhere on the reels, and you activate a “pick the box” style bonus game. It’s here that some of the real money can be won. Twenty circles appear, they’re picked one at a time to reveal various prizes. These are multipliers, multipliers and level ups, and multipliers and collect. As you work your way through the levels, you’re awarded increasingly large multipliers. Successfully collect eighteen multipliers, without picking the game-ending “collect”, and you’re taken to the Fortune Wheel. This will award an even large multiplier. Although none of the game symbols are massively valuable when compared with some slots, there are some that we’ve not mentioned yet. These are the typical Ace, King, Queen, and Jack tiles. 100x the coin value for Ace, or King. 40x the coin value for Queen, or Jack. One of highlights of Fortune Jump is the number of different ways you can mix your bet size up. You can adjust the number of coins bet per pay line, the value of each of them, and the number of pay lines. This is a massive amount of control handed to the player, and allows them to wage exactly what they want, where they want to. You can have up to 40 different pay lines active at a time, and can select between one and ten coins to stake on each one. You can also change the value of each coin too. The maximum being £5, and the minimum is 1p. This means the maximum possible spin price on Fortune Jump is a colossal £2,000. Whilst it’s nowhere near the best-looking slot we’ve ever reviewed, and the pay outs might seem a little underwhelming on paper, Fortune Jump is still a massively playable game. The different bonus rounds provide a unique take, on a sometimes repetitive medium, and they are affective at engaging the player, and keeping them entertained. This game has a rating of 4 / 5 with 362 total reviews by the users.